If shipping delivery method is selected, bread is packed in a cooler with dry ice, 2-day ground via FedEx. 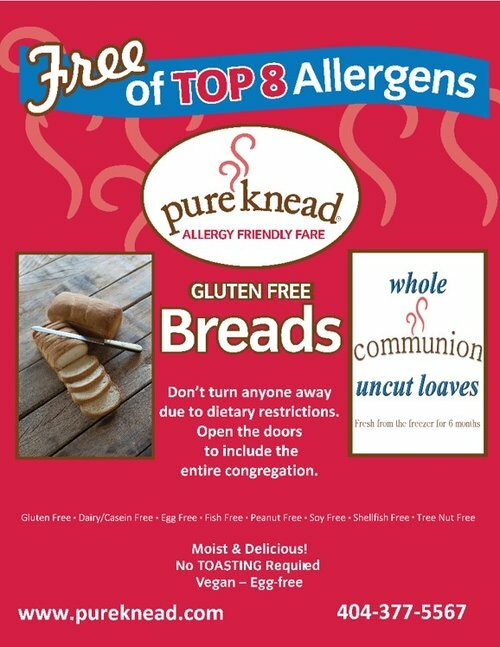 18 Uncut Communion Loaves that are “Free of All the Top 8 Allergens”. One loaf serves approximately 60 people. This loaf is good for intinction. The loaf is moist, delicious and will not crumble as it is passed through your congregation. Pure Knead Communion Loaves stay fresh in the freezer for up to 6 months. Just thaw on the counter the day before use and share.